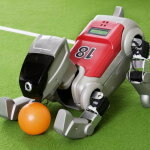 Quadrupted robot (four legged robot) | Hajime Research Institute, Ltd.
We are able to propose robot designs of animal robots (four legged robots) and other service robots. Aiming the autonomous robot platform in research and education, we co-developed the quadruped robot with Technische Universitat Darmstadt (Germany). In order to ease replacement or upgrade parts, such as servo motors and a camera, we designed the hardware with a modular structure using many commercial products. The robot has a motion controller and an autonomous controller (PC104 board) and it can be operated in autonomous control. The good design cover is attached to the robot in this photo.